Cities that want to build transit ridership in an era of major declines should pay far more attention to the weakest link: bus service. That advice comes from a new analysis of 2018 ridership data by TransitCenter, which shows that the seven cities that managed to grow transit ridership last year had either expanded bus service or completely overhauled their bus system in recent years. Three of those cities — Seattle, Houston and Austin — reorganized their bus systems substantially in order to expand frequent service in the last few years. (Seattle also greatly expanded total bus service). Meanwhile, San Antonio, Las Vegas and Pittsburgh all added substantial bus service since 2013, TransitCenter reports. And Detroit has expanded frequent service on its 10 busiest bus routes, adding about 500 trips a week. “In almost every American city, bus service carries the majority of trips, so it should be no surprise that cities have to improve bus service to grow ridership,” TransitCenter staff wrote in a blog post. 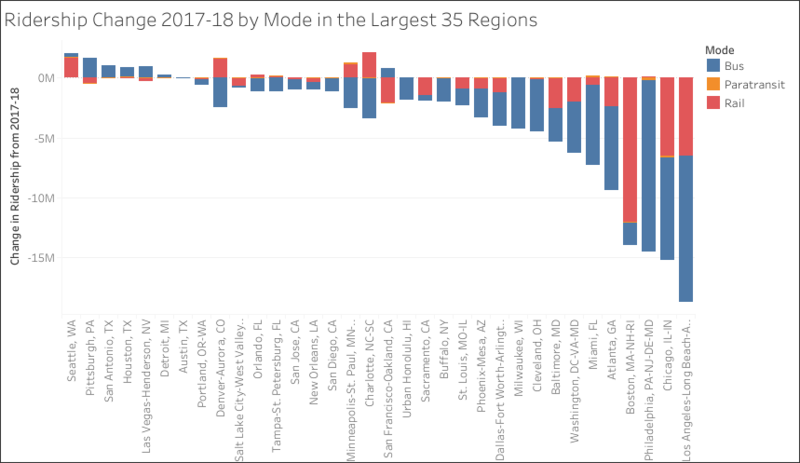 Most large cities with legacy rail systems with backlogs of maintenance are still struggling to check the decline in ridership, which is also affected by low gas prices and a deluge of underpriced Uber and Lyft cars. Among big cities, San Francisco seems to be performing the best. TransitCenter credits the city for improving bus ridership by adding all-door boarding, which speeds up bus journeys, across the city. As a result, all of the city’s gains were in bus ridership, even as the overall transit population declined. Yes, by all means improve your bus service. But understand that to significantly grow ridership you must attract people who possess a very high elasticity of demand. You must meet their specific desires. 1. The door-to-door time must be competitive. If it takes four times as long for him to travel by bus as by car, you will lose your customer. And you must include both his first-mile time and his last mile time in that calculation. I guarantee he will. 2. The price point must be competitive with the price the prospective customer would otherwise pay for gasoline to make the same trip. You don’t get credit for other car costs he would accrue anyways. He will still own a car. 3. You must must must Must MUST get vagrants and drunks off of his bus. Don’t demean your prospective customer by saying he just doesn’t want to be uncomfortable. This is about pestilence, disease, filth, and the potential for violence. Don’t treat him with condescension by saying he needs to have his consciousness raised. He won’t listen and he doesn’t care about your political agenda anyways. He cares about his experience on the bus. Carl hits it out of the park, the stands go wild. These are the points that will make or break any public transit! Why can’t anyone in the public transit industry understand this! What’s the data for New York City? It’s a curious omission from the chart. Yeah, that’s fair. And tolls as well. I tend to neglect those costs because for most people those costs are zero. What should a transit agency do if their biggest service deficiencies are outside of their control? In San Diego, the city’s busiest bus routes operate over the worst maintained streets in the city, streets so bad that one risks a back injury if sitting in the seats facing sideways. Those buses also routinely run late because the city won’t allow dedicated transit lanes. I agree. NYC’s got the largest transportation network in the country and has been excluded from the study for some unknown reason. They’ve implemented a BusSelect service in Manhattan that seems to speed up service using all door boarding. What’s more telling is LA being dead last with ridership increases. Could it be that bus travel is not desirable because the busses are stuck in the same traffic as the cars. In LA there is also a lack of express bus coverage with dedicated bus lanes. The Transit Center blog post ought to say, “In almost every American city, bus service carries the majority of transit trips…”, no? I’d love to be wrong (because that would be an awesome stat), but I very much doubt that in any US city bus service makes up even a plurality of all trips, much less a majority. Maybe the big takeaway is if you can’t afford to provide bus service that runs at least every 15 mins, then maybe focus your resources on routes that you can. Don’t forget serial killers a la Elon Musk. Although I thought they favored white vans. See, that falls under the category of “demeaning your potential customers”. You can’t persuade people like that. And calling Elon Musk a serial killer just makes you look ridiculous. That kind is statement only plays well inside the echo chamber. you must have missed that news byte. Elon Musk is the one who said he wouldn’t use mass transit because he claimed serial killers are lurking on it. That’s not quite his quote, but you can fact check this. A la refers to his quote, not his being one. Transit ridership decreased in almost every major American city last year. But there were two notable exceptions -- Seattle and Houston. Those two outliers share one thing in common: In addition to expanding light rail, they're both redesigning their bus networks. Today is the grand opening for the QLine, Detroit's 3.3-mile, mixed-traffic streetcar on Woodward Avenue. It's getting tons of local press attention, but TransitCenter reports that the Motor City's true transit renaissance is not due to the streetcar, but the city's successful, under-the-radar turnaround of its bus system.